Designs by Lisa Somerville: For the Grad! Happy Wednesday! I had originally planned on showing you some more Newsprint Reveal cards today, but unfortunately I hit a few bumps creating them - so I'll share them with you tomorrow. It's been rainy and cold here the last few days, DS had a track meet last nite, brrr was it ever cold. It dropped about 15 degrees while we were there, I think the car thermometer said 48 when we finally got back in the car. Anyhow, in a few weeks he'll be graduating from Junior High, and I thought I get a jump on his Graduation card. I'll be making some invites, to send out to family, but they won't be as layered as this one! I then stamped the 3 Step Graduation Set from Kitchen Sink Stamps for my focal image and sentiments on White card stock. My son's school color is Royal Blue - thus the color scheme. I stamped the cap in Brocade Blue, Brocade Blue again and Brilliant Blue. The tassel is stamped in Summer Sun using both images. The sentiments are stamped in Momento Ink Tuxedo Black using a SAMJ. The panels are adhered with dimensionals to the base card. Whether your follow my blog or just drop in occasionally, you'll notice I tend to use a lot of techniques in my daily postings. These techniques come from The Technique Junkies Newsletter. It's a wonderful Bi-Monthly Subscription based Newsletter, full of techniques with Step-by-Step directions. When you subscribe, you'll have access to the TJNL Yahoo Group, and also the Subscriber Only section online where you can see the Step-by-Step directions with photos. To find out more information, click the picture above - be sure to tell Pat, you saw the special on my blog. If you have any questions about the newsletter - use the contact me button on my sidebar, I'd be happy to answer your questions. AWESOME! I thought the image was computer generated or otherwise acquired...it looks so perfect! 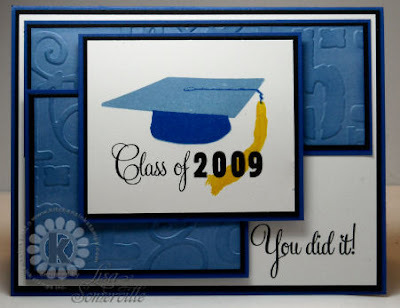 I'm sure you realize this but your grad card says Class of 2008 instead of 2009? ?